Notice anything in common? Yep – the both have filled maps. I wondered if that had anything to do with the slow performance? Because we are using client-side rendering, the bootstrap package has to pass all the data to the browser so it can draw it locally. This includes the marks which for filled maps are complex polygons requiring much more data to describe than a simple line or bar chart. Consequently, the bootstrap payload for a dashboard with filled maps can be ~1000x the size of an equivalent bar chart or even symbol map! Clearly, the use of filled maps requires a much larger data transfer to the client and therefore should be used sparingly in deployments where you have limited bandwidth. Or you could switch to server-side rendering – here are the results for the same workbook using the ? 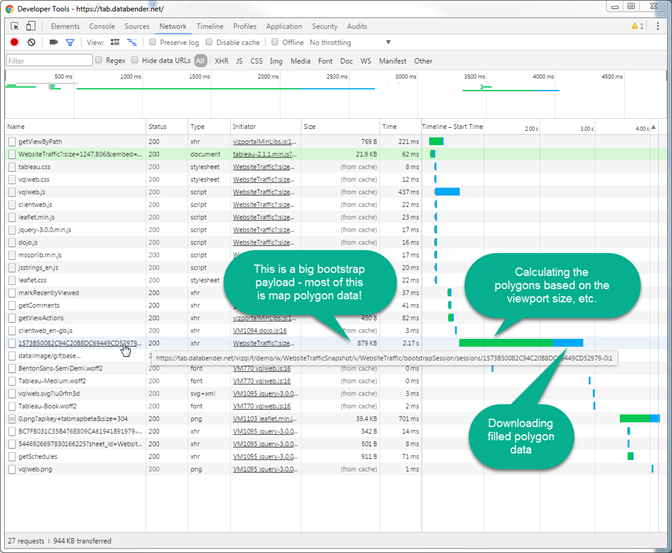 :render=no URL parameter – much faster! Great post Alan, I’m dealing with this issue at the moment. I started by revising inefficiencies in the data structure (I jumped on an existing project) to get load from ~20s to ~2s but will also switch on server-side rendering to shave load times.